Steiner Ranch is one of the larger master planned communities in central Texas today with more than 4,500 homes, apartments and commercial complexes. There has been tremendous growth over last 10 years and over 15,000 residents now call it home. Since the catastrophic fires of 2011, our Community has added over 500 homes and two apartment complexes (approximately 600 units in total). Now another 100 homes are being built in the northeast corner of Quinlan Park Road and FM 620. This means that all together, our Community has added more than 2,300 cars and 3,700 residents since the 2011 fires. This is a tremendous amount of growth and traffic added to Quinlan Park Road with no current improvements to our roads’ infrastructure. If Quinlan Park Road became blocked before Steiner Ranch Blvd during another catastrophic event (or for any other reason), 70% to 80% of Steiner Ranch residents would have no other evacuation route and alternate commute. Travis County and an independent engineering firm (retained by the County) fully realizes the graveness of our emergency evacuation and daily traffic problems. They have evaluated 12 routes, explored ways to secure a $7 million investment and overwhelmingly recommended Route F connecting Flat Top Road to FM 620 at east side of the Mansfield dam. To be clear, Route F is the only route option that will be fully funded. Route F will alleviate daily traffic and emergency scenarios for Steiner Ranch residents. Improvements to 620 are also critical and TXDOT is exploring ways to improve the portion of 620 outside of Steiner Ranch. These options include the 620/2222 bypass project and the additional lanes being added to 2222. The Steiner Ranch Board will continue to partner with local organizations, County, City and TXDOT to improve overall traffic patterns in our area. One of the primary responsibilities of the Steiner Ranch Master Association Board is to address the needs of the entire Steiner Ranch Community. After carefully evaluating all the information, considering the safety, evacuation and transportation needs of more than 15,000 residents, 2/3 of the Board voted to support Route F on March 4th, 2019. Questions were raised via email, social media and phone calls by residents prior to and after March 4th, 2019. In order to keep you as informed as possible, we have listed the questions we have received and provided as much information as possible to help every resident understand why the Steiner Ranch board supports the only fully funded evacuation route, Route F.
1. Why do we need Route F - Additional permanent road out of Steiner Ranch to 620? • Steiner Ranch community desperately needs another road connecting to 620 away from Quinlan due to tremendous growth over last 10 years. • There is a serious safety concern for our Steiner Ranch residents if Quinlan Park Road is the only exit out of Steiner Ranch. A method for fast evacuation of more than 15,000 residents from catastrophic emergencies is very much needed. • Route F will divert a portion of daily traffic on Quinlan Park Road away from Steiner Ranch Elementary School which will help to keep approximately 700 students safer. It will also help minimize the congestion on Quinlan Park Road during peak commute. • Route F will be available for daily emergencies as Quinlan Park Road can be jammed during peak hours of the day. • Another 100 homes are being built over the next 3 years at NE corner of 620 and Quinlan. This will add up to 200 cars to our current daily traffic exacerbating the current Quinlan traffic. • Route F is the only fully funded option available to Steiner Ranch. 2. Will Flat Top area residents benefit from Route F? • Residents surrounding the Flat Top road will benefit through Route F implementation. 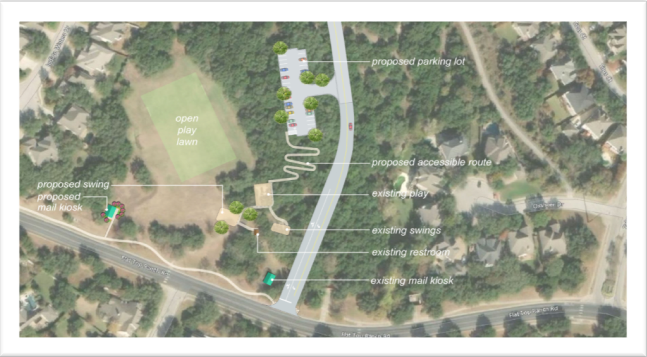 • Travis County committed to building a 30-car parking lot for the area parks. This will make Flat Top Road much safer because cars will not be parked on the street. • Residents in the Westridge and Headlands surrounding areas will be able to exit directly onto 620 without having to get into the congestion on Quinlan Park Road. Rerouting cars off of Quinlan Park Road will help to alleviate other neighborhoods whose only way to exit is Quinlan Park Road one direction. • New walk ways and paths along Route F will benefit the surrounding Flat Top residents. 3. Wouldn’t Route F impact residents that use the Westridge park and children walking and riding their bikes to school on Flat Top area? • Travis County is committed to addressing concerns raised by residents. Additional landscaping, vegetation, including berms, sound barriers and other safety measures will be implemented to improve overall safety, aesthetics and minimize noise. • Currently Flat Top Road gets packed with cars during sporting events creating hazardous areas for residents and children. The Route F plan includes a 30-car parking lot. This will lower the number of cars parked on Flat Top. Travis County will also take other measures to make the park area safer for children. • Westridge Park would be no more impacted than Towne Square Park is to Quinlan Park Road. Children cross Quinlan Park Road daily as walkers and bike riders to and from the elementary and middle schools. Those children cross 6 lanes of traffic daily. So much so that Steiner Ranch is working with LISD to expand Country Trails sidewalk to make room for the bikes. 4. When did this initiative start? Were there meetings with the residents and Board prior to the Steiner Ranch Board voting on Route F recommendation? • This Evacuation route project started early 2018. Yes, multiple meetings were held. Travis County representatives attended the Steiner Ranch Board Meeting in Feb/March 2018 and provided us with an update. There were subsequent open house meetings with all Steiner residents, with effected area residents, with working groups, with neighborhood organizations and their Boards or Board representatives, as well as discussions with community leaders. All of these meetings took place prior to the Steiner Ranch Board’s vote to support Route F.
5. Why did the Steiner Ranch Board vote on the Route F recommendation prior to full Traffic study results despite concerns expressed by Flat Top area residents? • The Steiner Ranch Board’s responsibility is to the entire community. The Board learned from Travis County that the full traffic study results would not materially impact the Route F decision. Additionally, initial results indicated that Route F traffic volume will be lower than earlier estimates. Route F is the only route that does not touch any residential driveways. • The Steiner Ranch Board gathered all the concerns from Flat Top area residents in last few months. Board ensured that commitment is received from Travis County for addressing residents concerns with a proper plan prior to voting on the Route F recommendation on 3/4/2019. 6. Will development (commercial or residential) along Route F be allowed? • No further development will happen. The land is owned by Steiner Ranch and Travis County. Travis County has confirmed they are not planning on selling the land they have recently acquired. The Steiner Ranch Board will not allow any development on the Steiner Ranch land. 7. Will Westridge Park be gone if Route F is built? • The park will remain as it is. In addition, a 30-car parking lot will be built next to the park. 8. Will Travis County acquire HOA land to build the Route F? • Travis County may use various mechanisms to acquire property for Route F, including right of condemnation / eminent domain. However, Travis County Commissioner’s Office explicitly stated that they prefer to collaborate with the Steiner Ranch Board in Route F implementation and work towards mitigating concerns. 9. Why did Travis County recommend Route F out of 12 Routes as another road for Steiner Ranch connecting Flat Top Ranch road to 620 (east side of the Mansfield dam)? o Route F is the only route that will be fully funded. This made all other route options impossible to implement which is why the County recommended Route F.
10. Will there be another Open House with both residents and Travis County officials? • Yes. Travis County is planning an open house with residents in April. Details to follow. 11. How long will the Route F road will take to complete once it is started? • Once started, the road may take up to 2 years for completion. 12. Where can I find the latest information on Route F (additional Road for Steiner Ranch) ? 13. Where I can go to voice my support for Route F or answer my questions? • Residents are always welcome to reach out to Travis County via email SteinerRanchEvacRoute@gmail.com to voice their support or address their questions. The Steiner Ranch Board will continue to focus on the projects that benefit broader the entire Steiner Ranch community. The Board will keep the residents updated with any new developments. Residents are also encouraged to visit the Travis County website.